Stephen Crane is usually known as that guy who wrote The Red Badge of Courage. Less well known is that he was also one of America’s finest and most experimental poets before his death in 1900. I think this is probably because no one really knows what to make of them. The most famous anthology of American poetry from that time, Louis Untermeyer’s Modern American Poetry; An Introduction, though it includes such luminaries as Eunice Tietjens and Clinton Scollard, makes no mention of Crane’s poems at all. They are quite unlike Walt Whitman, and quite unlike Robert Frost, and quite unlike Ezra Pound, so they do not fit neatly into smug chronologies of American poetry. The title poem is fairly well-known. The folks at Librivox have recorded audio versions of it–choose your favorite version here–for your delectation. Beyond that, the rest is an open encounter with one of the most iconoclastic voices in American poetry. What’s particularly groovy about this edition, though, are the illustrations by Will Bradley. Bradley was an extraordinary illustrator, renowned for his posters. His poster The Twins has been called the first American Art Nouveau poster. Bradley was well acquainted with the stylistic innovations of European artists and his work absorbed a certain amount of the French penchant for japonisme, especially in his use of the flat picture plane, broad color swaths and cropped forms. 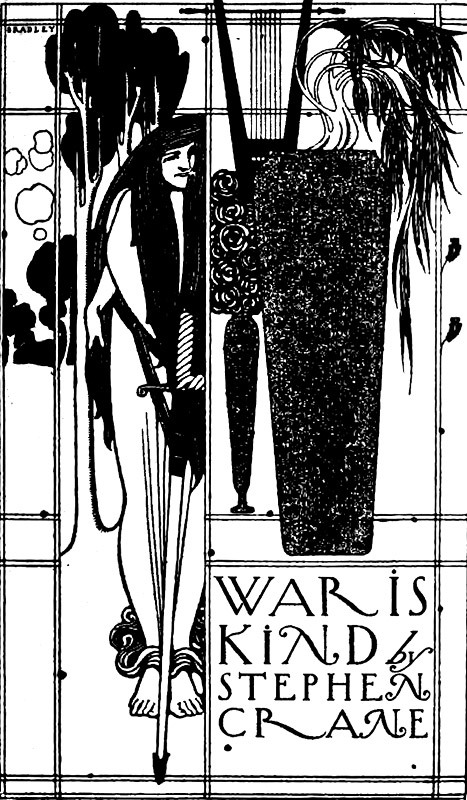 Equally, his work shows the rococo, decorative lines of the Art Nouveau movement, most obviously showing his sympathy with the work of Aubrey Beardsley. Bradley remained prolific in the graphic arts world until his death, working on architectural drawings for the Ladies Home Journal, spotting illustrations for a couple dozen magazines including Vogue, Harper’s and Life, serving as art director on several films, and illustrating at least eighty books, including this one. There are other versions of this book available. This one has been reformatted to preserve the original flow of the book itself, with the illustrations occupying their own pages when necessary, and the text divided up spatially according to the original pages when space was left intentionally by the designer. In short: this is the cleaned-up version. Download War is Kind EPUB here. Download War is Kind PDF from the Internet Archive here–but with a caveat. The regular PDF from the Internet Archive has two defective pages. The B/W PDF is complete, but it’s also almost ten times as large a file. But do not weep: books are kind.